Support for maintaining already healthy blood glucose metabolism, insulin and cardiovascular function. 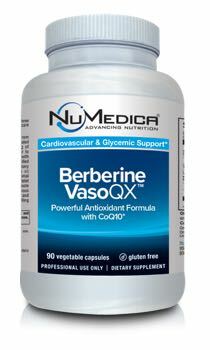 NuMedica Berberine VasoQX™ is designed to provide comprehensive support for healthy metabolic function. It offers support for maintaining already healthy blood glucose metabolism, insulin and cardiovascular function. Berberine has been found to aid in AMPK activation, a process which plays an important role in assisting metabolism regulation. With the addition of Gynostemma pentaphyllum and CoQ10, Berberine VasoQX™ provides powerful antioxidant protection and supports optimal vascular, immune and gastrointestinal health. Berberine is an alkaloid isolated from the Coptis Chinensis plant that supports the activation of independent metabolic pathways. Gynostemma pentaphyllum (GP), a member of the gourd family, is an herbaceous vine indigenous to Asian countries, and may increase the expression of the cellular pathways that promote fat oxidation, thermogenesis, and decrease the expression of lipogenic transcription factors. CoQ10 acts as an electron transport carrier within the inner mitochondrial membrane. Playing an important role in maintaining bioenergy homeostasis and ATP production within the mitochondria. NuMedica Berberine VasoQX - 90c 1 Capsule 90 Adults take 1 capsule 1-3 times per day or as directed by your healthcare practitioner. Other Ingredients: HPMC (vegetable capsule), MCC (microcrystalline cellulose), l-leucine. A natural supplement formulated to support healthy blood lipid factors, bile production, and liver function. 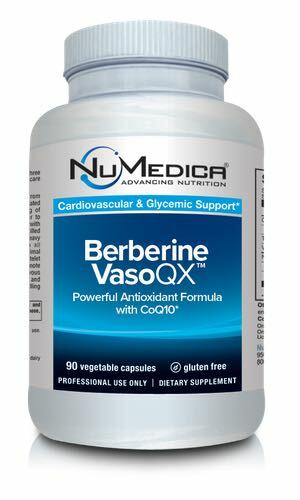 When did NuMedica Berberine VasoQX come out?